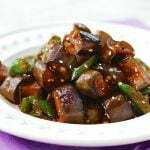 Here is another effortless Korean side dish. 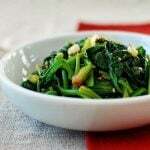 This time, it’s made with mung bean sprouts (sukju namul). 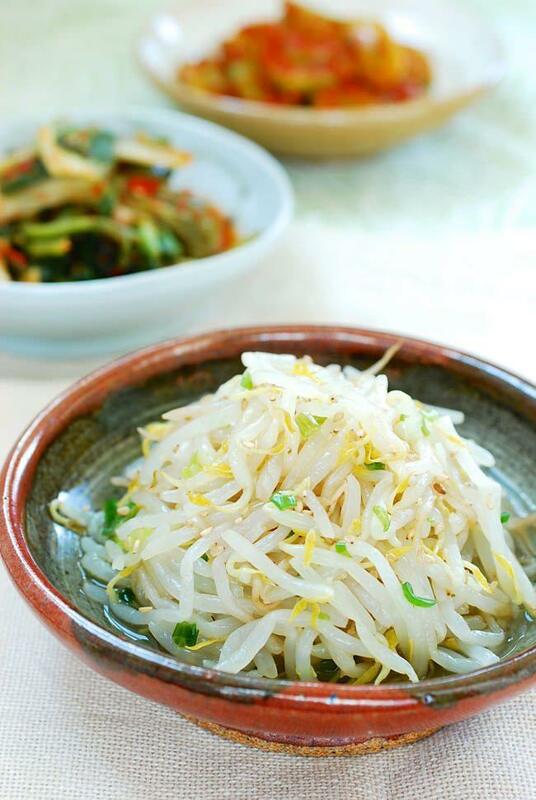 I used its full name here to distinguish them from soybean sprouts (kongnamul), but these sprouts are better known as simply bean sprouts in America – the same sprouts I used for nokdujeon and kimchi mandu. 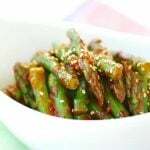 The cooking method and seasonings for this dish are very similar to its soybean counterpart. 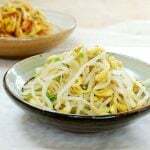 The most notable difference is that because mung bean sprouts don’t actually have the bean parts, they take less time to cook. Also, they contain a much higher water content. Squeeze the cooked sprouts to remove the excess water before seasoning them, which will make the sprouts much crunchier. You can also make this dish spicy by adding a little bit of gochugaru (red chili pepper flakes). Either way, it will be a pleasant addition to your meal! Also great in bibimbap! 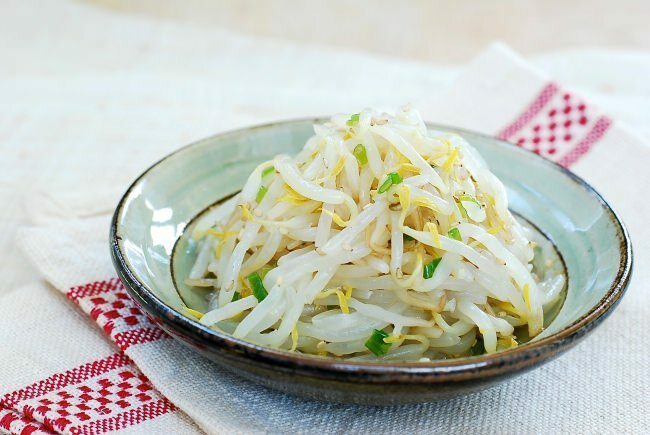 Rinse the bean sprouts twice in cold water. Boil 4 cups of water, in a medium size pot, along with a teaspoon of salt. Drop in the sprouts and cover. Blanch the sprouts until slightly softened, about 1 minute. Drain quickly. When cool enough to handle, gently squeeze out the excess water. Toss well with the remaining ingredients. Sample and add more salt to your taste if needed. I love it too. So good. Thanks for coming by! 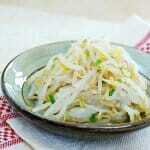 Hi Charles – It’s really easy to make if you can find bean sprouts near you. Hope you give it a try. Thanks for visiting! I know this is effortless and DELICIOUS! I can eat this entire batch myself, and I’m not kidding! 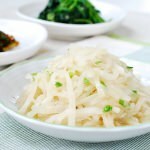 I love your green/bluish plate…so pretty and perfect for this simple bean sprout dish! Thank you, Nami! It’s one of my go-to side dishes. I love this, so healthy too. I could eat the whole thing. I have been srpouting my own sprouts lately and trying different beans. I have some garbanzos sprouting now. Have a lovely day. Wow that must be fun! I’ve only done it with soybeans. Thanks for visiting, Suzi! 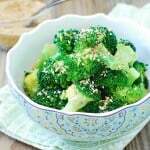 looks like a great side dish! Another simple and delicious condiment! Love both bean and soy sprouts. Thank you, Biren! I love them too. Thanks! Made this one tonight, and came out very well. Is it Ok to cool the sprouts in cold water after blanching them, or is it good to let them continue cooking a bit longer? Hi Will – Sure, it’s okay to shock in cold water. But, since the sprouts are blanched only for a short time, I don’t find it necessary. They still turn out crunchy. 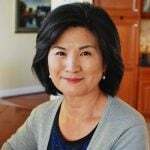 Thanks for trying out my recipe and coming by! 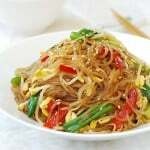 couldn’t u just use raw bean sprouts? You can in other dishes, but it’s traditionally blanched for this namul dish to draw out water to give it a crunch texture Korean namul is known for. Thanks! 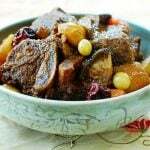 How far ahead of serving can I make this dish? Does it still taste good if make it the day prior to serving? Yes, it will be fine the day prior to, not too far in advance. Can I make a big batch of this that’s good for a couple days and put it in the fridge? Or it should be eaten right away after making it? Thank you. Yes, it will be okay for a couple of days, but not too much longer. Enjoy!